On account of my recent post about Lain, I feel inclined to talk a little about how it has influenced my art. As I think I may have mentioned before somewhere, Lain was what inspired me to begin painting anime. The reason for this is that Lain is a very powerful work, and I was deeply moved by its characters, story, and art. At the time it was also the first anime I had seen with such a high level of maturity, which made me realize just how powerful of a medium anime can be. "Lain." Acrylic and latex on canvas. 30 in X 42 in. 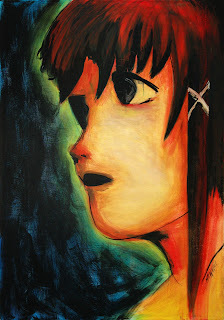 The first anime style painting I made was a portrait of Lain, in very vivid colors of course. I can't be sure as to my exact intentions then, and this was about six years ago, but I believe my choice to use more intense colors to make her "glow" reflected just how strongly I felt about Lain then. Little did I know, how this first painting would change the focus of my artistic endeavors. Now, I'm not sure how long it took me before I would attempt Akogare after this. I suspect it was a while. Though I did work on another doujinshi piece entitled Mai only several months after the Lain piece. In that school year, as this was during my art studies at RMC, I may have created somewhere around four finished paintings in this style. 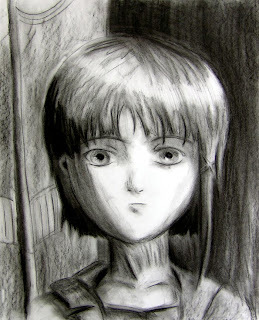 "Lain, Charcoal." Charcoal on paper. 18 in X 23 in. Sometime in 2001 when I first painted Lain, I created another portrait of her. In all honesty I don't recall which came first, but this was a charcoal drawing of the same character. It may have been a practice run to see if I could even do this style, but given my obsession with Lain it's difficult to be sure. The point I guess I'm trying to make is twofold. First, Lain is an incredible anime which inspired me to do what I do with my art. I think we got that one covered though. Second, Yoshitoshi Abe has been my most important influence artistically from that moment on. This is not to discount my primary influences prior to Lain, as they still show up in parts of my work. Yet I think it takes a lot to change an artist's focus so dramatically, and that change I credit to Abe. Someday, I intend to meet this man and tell this to him personally. Someday when I'm in Japan, as I intend to be there in the not so distant future.